In 1856, Edward Burnett Tylor, of inscribed with “Huitzilopochtli the god of war, Teoyaomiqui his wife, and Mictlanteuctli the god of hell” all compiled into a gruesome symbol of Aztec religion. “There is little doubt,” Tylor opined, “that this is the famous war-idol which stood on the great teocalli of Mexico, and before which so many thousands of human victims were sacrificed.” The famous sculpture, now surveying its victims in the Museo Nacional de Antropología in Chapultepec Park, took on an early identification as a female divinity and passed into common culture as Coatlicue (“She of the Serpent Skirt”). She is now, so a more recent theory holds, not simply the earth/mother goddess, but a representation of a tzitzimitl, one of any number of female sacred personages of ambivalent powers and actions. At their worst, the tzitzimime (pl.) could be “star demons” descending to devour humans, but for the most part these female powers, in good Aztec fashion pivoted around duality, a complementarity that balanced threat with surety in their various avatars. Tylor’s observations about the “war goddess” and Mexico overall, peering into its barbaric past through the residual survivals of a culture he predicted would fall to the United States, is a good mix of science and great deal of fiction. While not exactly “science fiction” as we have come to know the genre, travelling forward from his time we can see how the spectacle and rudeness of Aztec ritual and human sacrifice aided Tylor in his scientific speculations on the evolution of cultures and the pre-modern human mind at work as it grasped to understand the natural world. 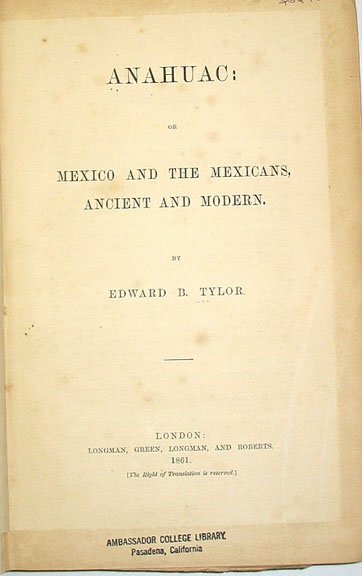 Ever the scientist, Tylor studded his travelogue with the best resources of his time, quoting Lord Kingsborough on Mexican antiquities, Humboldt’s meticulous measurement and mapping on Mexico a half century earlier, and he even provides the reader with a “Table of Aztec roots” to be compared with Sanskrit and related Indo-European forms. Yet despite his best scholarly efforts, Tylor’s Anahuac is “fiction” in the same way that Europeans have drawn on their vast reservoir of myths, legends, and stories of Amazons and the Lost Tribes of Israel in their mastery of the Americas. Columbus (in)famously believed he was near the Garden of Eden as he entered the Orinoco in 1498. So, too, Tylor, while careful to dismiss any number of arguments claiming “supposed Aztec-Bible traditions,” cannot contain his wonder at the similarities between the Aztec and Hindu cosmogonies, and Aztec and Asian calendrics and astronomy (“resemblances in the signs used that seem too close for chance”). In Aztecs, one of the travellers, Barbara, is mistaken for a reincarnation of the dead priest Yetaxa. And, never mind that Yetaxa, who was male reincarnates as a woman, for as Barbara/Yetaxa notes, it is the spirit of Yetaxa, not the human form that counts (more on this later). Because Barbara is a history teacher with, conveniently, a specialization in Aztec history she knows the Spanish will arrive and destroy the Aztec empire. Thinking that if she can play out her ersatz goddess role she can rid the Aztecs of human sacrifice, preserving only the good in Aztec culture, and thus convince Cortes to spare them from destruction. “You can’t rewrite history!” warns the Doctor. “Not one line!” Ultimately, Barbara/Yetaxa fails to thwart human sacrifice, and as they say, the rest is history. What the writers of the Aztecs serial couldn’t know was that their fiction turned out to be closer to the idea of Nahua “divinity” than Tylor’s educated view. Like most scholars of Aztec religion, Tylor believed that Aztec “gods” bore similarities with Indo-Europeans too close to ignore. Like his comparison of Nahuatl words to Sanskrit and Greek, Tylor continued the common error of classifying the Aztec teteo to the Olympian pantheon. Science fiction’s imaginative leap away from the pantheon model to Yetaxa’s spirit leaping from body to body is much more in line with our current understanding of how sacred power worked in ancient Mexico. As scholars of religion engage the thought experiments in science fiction, we are forced to think and imagine beyond the building blocks of the previous generation’s knowledge. Tylor might have benefitted from taking on the colossal Mexican Coatlicue monolith on its own terms rather than fall back on the work of earlier speculators like Kingsborough. Maybe, like our ancestor ape-men confronting the black stela in 2001: A Space Odyssey and being catapulted a million years into space-travelling homo sapiens, Tylor would have made the leap from mere scientist into more provocative, certainly more compelling and lyrical interpretations of the stone goddess. On a number of occasions, reading Tylor’s travelogue suggests that, indeed, he had found his way into Dr. Who’s TARDIS, travelled through time and space and landed in Mexico. But unlike the curiosity and cleverness of the Dr. Who travellers, Tylor ‘s imagination was limited by his ethnocentrism and stodginess. For him, Mexico continued its pitiable decline, a “second-hand” culture as he saw it. Because Mexicans were “totally incapable of governing themselves” as he saw it, it was inevitable and positive that this failed state be swallowed up by the United States. For Tylor then, travelling back to Aztec Mexico through the archeological remains at Cholula and Xochicalco, the pyramids at Teotihuacan, and displays of ancient objects in museums restored for him the glories of ancient Mexico which at the time were mostly fictions of science. Great paper Rudy! Wonderful to such a thorough exploration of Tylor’s ‘Anahuac’ which is pretty rarely read these days!